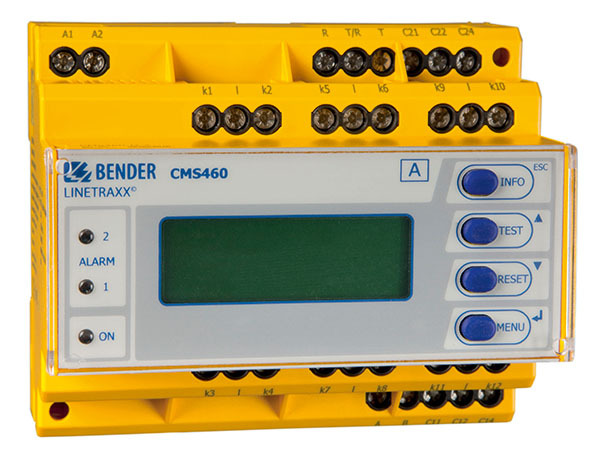 The CMS460 system consists of one or several CMS460-D load current evaluators which are able to detect and evaluate load currents in earthed and unearthed power supplies via the associated measuring current transformers. The maximum voltage of the system to be monitored depends on the nominal insulation voltage of the measuring current transformer used in the case of busbar systems, or on the cables or conductors that are routed through. W… (closed), WR… (rectangular) and WS… (split-core) and WF… (flexible) measuring current transformers are used for alternating and pulsating currents. Any combination of the various measuring current transformer series can be connected to the evaluator measuring channels. Each CMS460-D utilises 12 measuring channels. Up to 90 load current evaluators can be connected via a BMS bus (RS-485 interface with BMS protocol), thereby up to 1080 measuring channels (sub-circuits) can be monitored. If this product is to be used for fire or plant protection, the frequency response can be set accordingly. The measured currents can be analysed for harmonics.